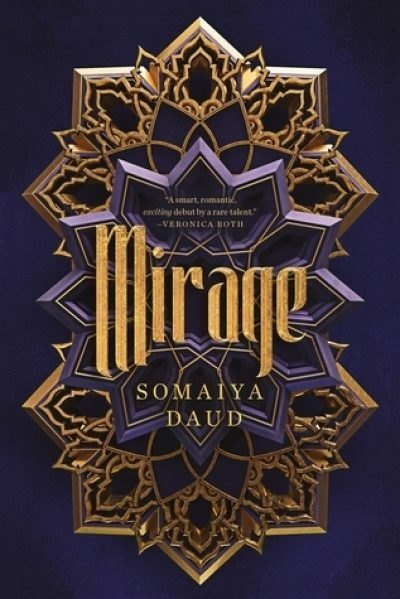 2018’s Mirage is the first novel in Somaiya Daud’s Mirage series. It is her debut novel. When environmental collapse forced the Vathek from their homeworld, they conquered new worlds. Amani’s world Cadiz was one of the Vathek’s victims. Her world was invaded, defeated, then ruled with ruthless brutality. As long as she keeps her head down, the worst Amani has to fear is death by starvation or random mass execution. Terrible fates but nothing personal. Amani is not so lucky: she has one remarkable quality that will mark her out for an extremely odd yet dangerous role in the Vathek state. She looks just like a certain Vathek princess. Maram may be the heir to the imperial throne … or perhaps not. Her father has so far failed to formally name her as his heir. She has become a target of intrigue and possible assassination, but she lacks the political clout to effectively resist. Harsh circumstances have made her a harsh person. Many see her as dictatorial, unforgiving, and razor-tongued. They might be right. The discovery of a Cadizian double was fortuitous. Amani is conscripted to stand in for Maram on state occasions that require presence but not active participation. Amani still must learn to appear to be Maram: to carry herself as a Vathek princess, to speak a few words as Maram. If she fails, she will be harshly punished. Or worse. Maram finds her new double more useful than expected. She tests Armani’s imposture in a few social situations. Amani successfully passes for Maram. The princess doesn’t enjoy social events, so falls into the habit of dispatching Amani in her stead. This practice has some unexpected side-effects. Amani learns much about Vathek culture and politics. Amani is thrown together with Maram’s fiancé Idris, who proves more observant than Maram expected. Amani connects with those who resist Vathek rule. This may seem to be an ideal setup for fomenting revolution, but … if a revolt fails, Amani will not pay the penalty alone. Her family and anyone even remotely connected to her will be punished as well. I ordered this because I liked the cover. I am just that shallow. I don’t know why the author wrote this as an SF novel. The SF details are perfunctory: there are droids (a term which I thought LucasFilm claimed as its very own) and various terraformed moons and planets. There’s a fleet. There is galactic law that does not seem to be enforced. Otherwise, there’s very little in this book that would distinguish this from a fantasy set in a world with prophecies and guns. Ah well. At least it’s set in a galaxy that isn’t just white guys from Southern California with new labels. Daud draws on Moroccan history for her setting, as well as on the long history of conquerors attempting to erase every vestige of the culture of the conquered. No coincidence, then, that the first step in the transformation of Amani into Maram’s body double is to remove Amani’s tattoos. Such customs are not for the Vathek or those who serve them. This is very much volume one of an on-going series. Its role is to establish the world in which Amani lives and the stakes for which she is playing. Actually resolving any of the situations is beyond the remit of this novel. For that look to future volumes. Amani is an engaging character; the setup is intriguing; I believe that I will keep reading. Comments are currently not working. Please comment at my Dreamwidth account. Mirage is available here (Amazon) and here (Chapters-Indigo).